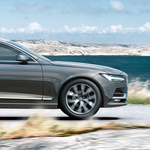 What is Included With the Volvo S90 Momentum Trim? At Smothers European Volvo Cars, we like to keep our consumers in Santa Rosa informed about the vehicles that they are considering for their next purchase. The S90 Momentum is an exceptional luxury sedan that is one of the top models in its class because it offers a number of features that provide drivers and passengers with comfort and convenience. To keep your rear seat passengers comfortable, the S90 Momentum was engineered wth plenty of leg room in the back seat. In fact, it has 4.5 more inches of leg room than its rivals, such as the BMW 5-Series, the Mercedes-Benz E-Class, and the Audi A6. With the S90 Momentum, you don't ever have to worry about your passengers feeling crowded. This trim is also the only luxury sedan in its class to offer a panoramic moonroof with a power sunshade as a standard feature. This lets everyone in the vehicle enjoy fresh air and natural lighting.